Location: Part of Dudley Zoological Gardens Dudley, West Midlands, England. Ownership / Access: Dudley Zoo. Castle open to public. 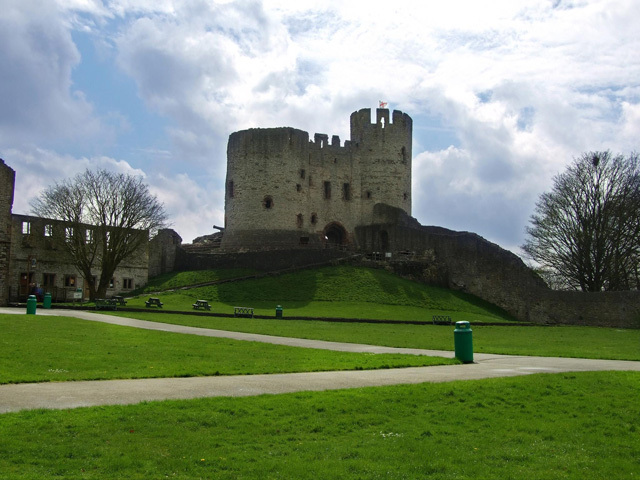 Notes: Dudley Castle is a ruined fortification in the town of Dudley, West Midlands, England. Dudley Zoo is located in its grounds. The location, Castle Hill, is an outcrop of Wenlock Group limestone that was extensively quarried during the Industrial Revolution, and which now along with Wren's Nest Hill is a Scheduled Ancient Monument as the best surviving remains of the limestone industry in Dudley. It is also a Grade I listed building. The Dudley Tunnel runs beneath Castle Hill, but not the castle itself. The castle visitor centre was opened by Her Majesty Queen Elizabeth II in June 1994, and amongst other exhibits housed a computer generated reconstruction of the castle as it was in 1550, displayed through hardware that demonstrated the first use of the virtual tour concept, prior to its widespread adoption as a Web-based browser utility. More details of how Her Majesty became the first Royal to experience a virtual world here. Aerial photo of Dudley Castle. Other map and aerial photo sources.